Patricia and I 'sailed' on the SPIRIT OF AUCKLAND for 36 days. Before boarding the vessel we toured Australia and Tasmania. - Flight to Melbourne. Also a fine city but I prefer Sydney, not only do I know it better, the expansive harbour of Sydney is second to none. A few days with Ray and Linda at their house about 70 miles from M.
- William and Jenny arrived from Victoria and we drove the scenic Great Ocean Road to Adelaide. A new for me, city of churches, smaller then S. and M. More colonial. Visited Barossa Valley, wine region founded by Germans about 1850. - Visited Australian Open Tennis for a few days. Good atmosphere. Saw a few games. Unusual for me. Spending money watching prof. sports athletes often earning ridiculous amounts of money, not my thing. HISTORY OF AUSTRALIA IS THE HISTORY OF BRITAINS OVERESEAS PENAL COLONIES. THAT IS WHAT STARTED COLONISING THE CONTINENT. - 21 crew, mostly Burmese, incl. all 4 deck officers. 2 Russians, 2 Ukrainians, 2 Ethiopians. 3 passengers. The third passenger an unfriendly, miserable limey, who did not endear himself with captain and crew. He did the 72 day round trip. - Cabin clean and serviced regularly. Deck chairs rusty and in poor shape, should be replaced. - We walked hundreds of stairs every day, up and down to the dining area, our cabin was on floor below the bridge. Ships office at deck level, computers/email here too. - Patricia and I had the ' owners cabin ', captain on one side, chief on the other. Spacious living room ( desk, chesterfield, 3 lounge chairs, fridge, TV, cabinet ) bedroom with 2 good size beds ( much storage for clothing ) and bathroom/shower. 3 good size opening oval port holes, air conditioned and heated. - Impressive how containers are loaded and unloaded. Also how quickly, night or day. Time is money. Harbour times 8 – 20 hours. - 4 harbours in NZ, named above. Sailed with ZERO GRAVITY, my 41' catamaran, into all of them in 2008 and 2009. Son Lance's prognosis that Patricia would leave the vessel in Auckland, fortunately did not happen. She did not get sea sick crossing the Tassy and also not during a few rough days later on. We met Leo and Diane in beautiful Tauranga. Meeting with Carey ( he crewed for me several times ) in Auckland did not happen. Vessel left earlier than planned. - 17 days crossing the PACIFIC, also known as the GREAT and/or QUIET OCEAN. 12,700 km for land lubbers. Mixed weather, mostly fine. A few days 40 knots of wind. - Flying fish, dolphins, whales, birds only about 1000 km close to shore, no other vessels until about 800 km close to shore. IT IS A BIG OCEAN........I previously crossed it in a 40' sail boat from Mexico to the Marquesas and did not see land for 21 days. - Freighters have no stabilizers like cruise ships. Ship rolls from left to right and right to left. The more wind and waves, the stronger the roll. At 20 degree roll the elevator aboard ship can no longer be used. - All hands on deck, fire aboard, ship is sinking, abandon ship.......we did all the required manoeuvres with only the captain on the bridge. 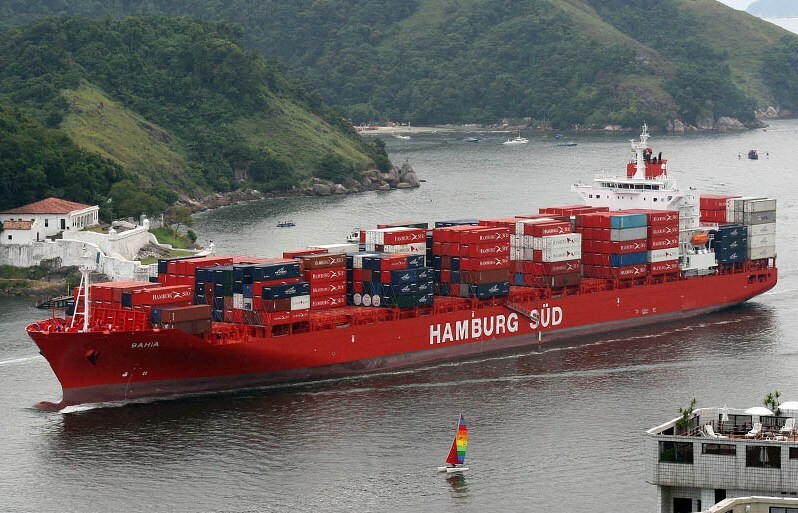 - Panama Canal – SPIRIT OF AUCKLAND is ' Panama size '. Uses the old canal with about 50 cm room each side. Old Panama uses locomotives on both sides to pull the ship along. 18 Panamanian line handlers came aboard. - Rode in to the Philadelphia Schlaraffen PENN CASTLE. Patricia was made ' invisible '. Fine visit. - In 1966 I was aboard the 8500 ton Polish freighter OLESNICA from Mombasa to the Kiel Canal ( near Hamburg ). I had booked an 8 days passage to Suez. However, one of the 4 propeller blades broke off during the trip. Long delay and I changed the trip from Suez to the Kiel Canal and was aboard for 50 days. This trip and also that I had worked as a deck hand on a 500 ton coaster in the Baltic and North Sea in 1966, had given me some knowledge of what to expect. - Patricia knitted, I wrote a book ( not yet finished ), we read, watched some movies, did some games, looked at the ocean, studied wind and weather, meditated........we became part of the ship, part of her routine and felt very much at home after a week. Learned much and saw a lot, we found it a terrific experience. It was good to see Patricia enthusiasm and enjoyment of the many technical and mechanical workings of a self contained ocean freighter. She spent much more time then I studying charts, the many navigational instruments, those that watch over the containers and controls over the entire ship. It is not for everyone, actually not for many. One has to be healthy, fit, flexible, adventurous, adaptable, put up with some dirt and some inconveniences. This is REAL LIFE, not another ' canned holiday '. You make your own entertainment. You live without cell phones, news and televisions (perhaps watching a DVD sometimes) ------ ALL THAT I LIKE ------ in today's life of hurry sickness, instant connections with anyone, anywhere, anytime, with little eye contact among people who always staring in devices. Smell the roses, hug a tree, enjoy ocean surf, birds soaring. BE YOURSELF, DON'T FOLLOW BLINDLY.